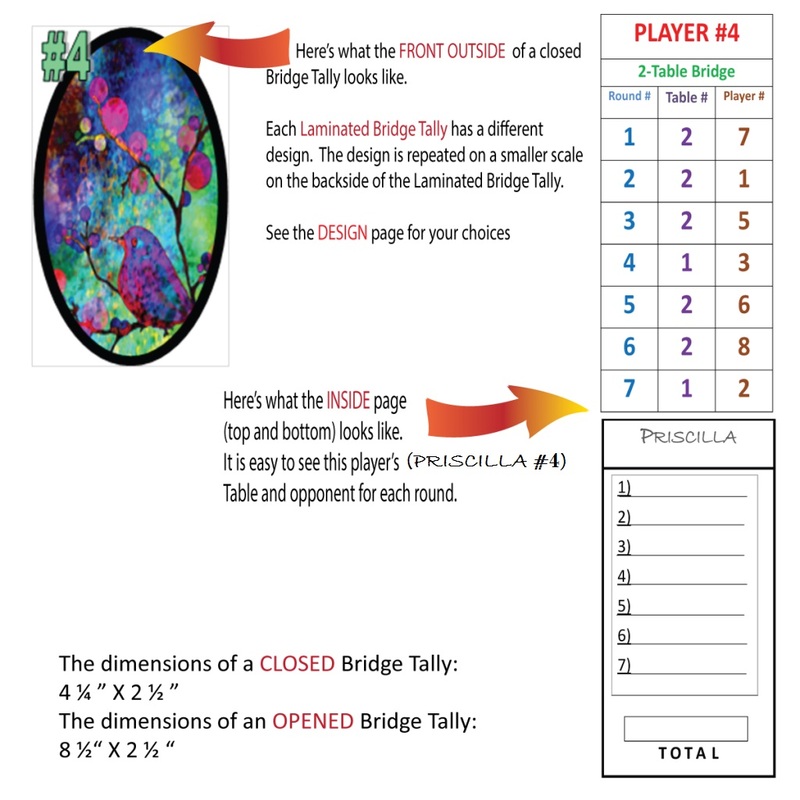 Tallys may be the answer to ‘how to run’ your holiday bridge games. Upon request, Gayle Harmon of Tally Ho has submitted this explanation for Great Bridge Links. What Is A “Tally Ho Laminated Bridge Tally”? Tallys are designed for Bridge Players who play progressive bridge with two or more tables. At Tally Ho we have Bridge Tallies for individual play – up to 8 tables (32 players) and couples’ play – up to 6 tables (24 players). Each Tally is specific to an individual or couple who is playing as Player or Couple #1, or #2, or #3 ö etc. The Tally clearly shows the Player (or couple) with whom they will be playing in each round and at what Table #. The rotations are shown in LARGE TYPE, which makes it very easy to read. Our “Tally Ho Tallies” are laminated so they will last a very long time and are impervious to spills and greasy fingers. Each Tally comes with a pad of 10 Tally Sheets – which are refillable. Each Tally Set comes with the appropriate number of Score Pads (1 for each table), with 20 sheets in each Pad ö which are refillable.